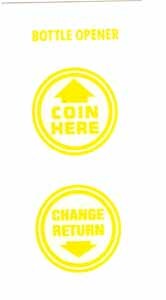 Coin Here and Change Return are in circles. Also has Bottle Opener to complete the set. Seen on some VMC-33 single door VMC-33-3D VMC-27 single door and VMC-72 machines. Yellow, water release decals. Circles measure 1-7/8 inches. Bottle opener is also 1-7/8 wide.